Now that the Monday nighter between the Colts and Giants is in the books and your fantasy football scores are final, week nine of the NFL season is officially on record. 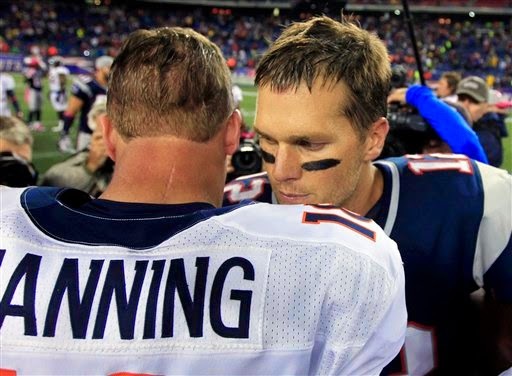 With it, so is another round of Manning v. Brady, and like most meetings between the two, Touchdown Tom came out on top. Brady is now 11-5 all-time against his only true under-the-center rival, with the Patriots besting the Broncos 43-21 in Foxboro Sunday afternoon. Of course, the most interesting part of this rivalry is that it isn’t really a rivalry at all in the truest sense of the word. Manning has now QB'd two different teams throughout the showdown’s tenure, and as much as we want it to be, it isn’t a classic one-on-one battle between two athletes in the way it is so often billed. It certainly isn’t Ali/Frazier or McEnroe/Borg or Palmer/Nicklaus. It’s two football teams playing against each other, not two men squaring off mano a mano. And it’s also why Brady is the clear cut owner of the rivalry. There’s simply too many other variables in the equation when football teams play each other, and the Patriots have been better than the Colts and Broncos near unanimously. The Pats have most always had a better defense, definitely a better coach, and usually more talent spread across both sides of the ball as a whole (this year is probably an exception to that last rule, but I digress). It doesn’t mean that Brady is better than Manning any more than it means that the other Manning brother is better than Brady because he owns two Super Bowl wins against Gisele’s better half. It probably isn’t either of the following, but is definitely more “any given Sunday” than “Tom is better than Peyton.” More “heads-to-heads” than “head-to-head”. The debate rages about which is better while both keep hurling touchdown passes and will continue until long after they’re both gone from the gridiron, and that’s fine. I just don’t think it’s fair to base their merits on head-to-head showdowns. In reality, the nearest comparison to a sporting rivalry that Manning/Brady brings to mind is Magic Johnson's Lakers and Larry Bird's Celtics in the heyday of the NBA’s resurgence in the 1980’s. But even here, the analogy falls apart. One player in five in your starting lineup goes a lot further towards a distinct comparative advantage than the one in eleven ratio that manifests on a football team. That said, we are in all ways lucky as fans to have witnessed these two go at it each of the sixteen times their teams have met. I often drift into this we-had-it-so-good-in-my-day sort of reverie because it becomes part of what you get to talk about with younger fans as the years roll on. That’s right kiddos––I will someday get to say––I got to watch Jordan and LeBron in their prime, dominate two completely different eras of NBA hoops. I got to watch Tiger Woods rule over the game of golf in a way that no one else ever will. I got to watch both Pete Sampras and Roger Federer play tennis, and I still can’t say who’s better. Oh yeah, and I got to watch Tom Brady and Peyton Manning throw the football in the same, amazing era of NFL offensive firepower. When all’s said and done, they might be the two greatest quarterbacks that ever lived, and I was around to watch them both go. Even as they age, their talents remain prodigious, their statistics are still both gaudy and in near all cases record-setting, their mutual respect is unflappable, and their auras perpetually inescapable. So, who else is ready for meeting number seventeen?